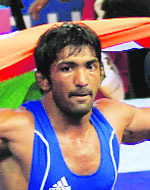 Olympic medallist Yogeshwar Dutt has paid the price for the Wrestling Federation of India's (WFI) financial dispute with FILA, wrestling's world body, as the grappler wasn't allowed to participate in the Golden Grand Prix event in Azerbaijan by the organisers on FILA's instruction. Indian professional Gaganjeet Bhullar was three-under-par for the day after 16 holes and one stroke ahead of his nearest rival when play was suspended for the day at the Indonesian Open, being played at the par-71 Pantai Indah Kapuk golf course in Jakarta. Punjab managed a slender first-innings lead of 21 runs before reducing Haryana to 117 for five in their second innings in an exciting fifth-round Ranji Trophy encounter being played at the Bansi Lal Stadium here today. Vinod Kambli, the former India player, was rushed to hospital this morning after he suffered a heart attack while driving from the neighbourhood of Chembur to his home in Bandra. He was rushed to Lilavati Hospital by a lady police constable who was directing traffic. The police said Kambli had pulled up his car on the way and was in pain when constable Sujata Patil noticed his condition, and rushed him to the hospital. Sachin Tendulkar today said he was not too comfortable with the idea of having a computer in the dressing room but came to accept the device after realising how important it was to plan and strategise. The stage is set for the fourth World Kabaddi Cup scheduled to begin tomorrow at Bathinda. The final will be played at Ludhiana on December 14. Twelve teams in the men's and eight teams in the women's section will battle it out in the mega event. Gurdaspur's legendary 'rubber doll' manufacturing factory — which over the years had gained fame for having produced national and international gymnasts in significant numbers — has gone bust following financial constraints. Sportspersons from and around Bhiwani held a large-scale protest following the death of an athlete, Abhishek, in a road accident. Gregg Clark, India’s junior hockey coach, said the upcoming Junior World Cup could be a stepping stone for the country to regain its lost glory. “India has a rich history of hockey and distinct style of play. They won many Olympic medals in the past. That's the history you want to replicate in the Indian hockey. You got to start from somewhere. May be, this World Cup is the start of that. We can only hope. We just need the structure around it (Indian hockey) to be tightened up,” Clarke said. Yogeshwar was India's lone entry to the event, where over 200 of the world's best wrestlers from 35 countries competed in the Olympic wrestling's three styles from November 22-24. The wrestler, accompanied by chief coach Vinod Kumar, was in for a shock when the organisers barred him from participating at FILAs behest, owing to the world governing body's tiff with the Indian federation. WFI owes some money to FILA for hosting the Asian Wrestling Championships in New Delhi from April 18 to 22 this year. FILA had demanded the money from WFI during the World Championships in September in Budapest. The Indian federation, at that time, assured the governing body that it would pay up during the Heydar Aliev Memorial Invitation. FILA, however, instructed the organisers not to allow the Indian entry, Yogeshwar, in the event till the issue was not resolved. “Federation must be aware of what went wrong in Baku. There was some problem which I don't know. You should ask our coach Vinod Kumar or the federation officials. All I can say is that I wasn't allowed to participate. It was an important tournament for me for three reasons. First, I would have competed as per the new rules introduced by FILA from this season. My injury did not allow me to compete in tournaments with new rules. Secondly, I would have competed in new weight category (66kg), not in my usual 60kg category. As per the changes in weight categories, I am supposed to switch to higher weight category,” said dismayed Yogeshwar. “And thirdly, it takes time to get into rhythm. It was disappointing for me to come back without competing.” To keep himself motivated, Yogeshwar decided to participate in an invitational tournament in Azerbaijan with the Commonwealth Games, Asian Championships, Asian Games and World Cup lined up next year. Making a comeback in sport is never easy. For Yogeshwar, it was akin to starting from the scratch after knee and back injuries sidelined him for almost a year. From Yogeshwar's lukewarm response, it's obvious that he doesn't want to upset the federation officials. “My job is to go to a tournament and compete. What happened there and why it happened, I don't know. I don't want to discuss the matter further. I just want to forget the year 2013 and concentrate on the next year. I have no injury issues now. I am fit enough to compete in international tournaments,” said the 27-year-old from Bhainswal Kalan, Sonepat. When contacted, WFI general secretary Raj Singh first tried to play down the incident by merely saying that it was Yogeshwar's change in weight category that led to his non-participation. But when quizzed further, he accepted that it happened due to delay in payment. “We are waiting for a report from our chief coach Vinod Kumar. The actual reasons will be known once he files his response. There was some delay in clearing the dues. We had assured FILA that everything will be cleared during the invitational tournament. We had sent cash with Vinod but FILA decided otherwise,” said Raj Singh. Bhullar started his second round in the same form that saw him card a sizzling eight-under 63 in the first round and made a birdie hat-trick on the third, fourth and fifth holes. He had another birdie on the eighth to make the turn at four-under for his front nine holes. However, he faltered with a bogey on the tenth, recovered with a birdie on the 13th but yet another bogey on the 15th hole saw him at thee-under for the round when play was called off due to a threat of lightning. This left him one stroke clear of second placed Prom Meesawat of Thailand, who completed his second round with a five-under 66 today and was tied second alongside countryman Jazz Janewattananond at nine-under 133, who still has to complete the last two holes tomorrow. SSP Chowrasia was amongst the lucky few who finished their round. He carded a five-under 66 today and moved up to a tie for the 13th place with a total of four-under 138. He was tied alongside local professional Sujjan Singh, who was level par for the day after 11holes following a four-under 67 yesterday. Anirban Lahiri carded a three-under 68 and was tied 21st at three-under 139, alongside Jyoti Randhawa, who carded a 70 in the second round. Abhinav Lohan was at two-under 140 with two identical rounds of 70. Himmat Rai, who carded a 73 in the first round, was four-under for the day with a total of two-under-par for the tournament after 14 holes. Chiragh Kumar, Shiv Kapur and Daniel Chopra were tied at one-under-par, though Kapur and Chopra had played only 15 holes when play was suspended. The cut currently looks likely to be applied at two-over 144. Rahil Gangjee is on the borderline as he waits for the entire field to complete the second round. Chandigarh's Ajeetesh Sandhu is at five-over 147 for two rounds. Haryana now have an overall lead of 96 runs with five wickets in hand. With two days remaining in the contest, an outright result looks inevitable. Starting the day at 50 for three, Punjab scored 184 in their first innings, largely due to an 86-run partnership for the seventh wicket between Gurkeerat Singh (51) and Mayank Sidhana (43). The duo came together when Punjab were tottering at 88 for six with Harshal Patel (4/60) and left-arm seamer Sanjay Badhwar (4/46) running through the top-order. While Gurkeerat went after the bowlers, Sidhana held one end up as they crossed Haryana's first innings score of 163. But they lost the last four wickets for only 10 runs, and hence 21-runs lead was all they could manage. In the second innings, Punjab medium pacer Sandeep Sharma (3/26) again rocked the Haryana top-order, reducing the hosts to 86 for five. However Sachin Rana (21 batting) and Amit Mishra (13 batting) added 31 runs for the unbroken sixth wicket stand. Meanwhile, Harbhajan Singh, who sustained a shoulder injury in Punjab's previous match against Gujarat, will be out of action for 14 days. 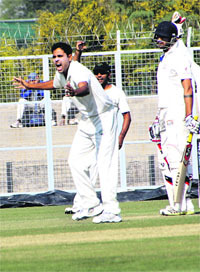 Brief Scores: Haryana 163 & 117/5 (Avi Barot 31, Sachin rana 25 batting, Sandeep Sharma 3/26). 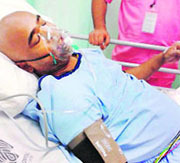 According to a hospital official, Kambli had been admitted to the ICCU and his condition was stable. Doctors were conducting various tests on him, the official said. Kambli, who is known for his record run partnership with Sachin Tendulkar, had been admitted to hospital with a heart condition last year as well. He had undergone angioplasty on two of his blocked arteries, according to reports. Kambli, whose career was cut short due to his erratic performances, is known to attract controversies. After failing to make it in politics and cinema, Kambli in recent times has had troublesome relations with his neighbours at the housing society where he lives. “I had already played for India for 12-13 years. This was in 2002-03, when computer was brought to our dressing room. We were told that computer is going to store all the data and we will have access to whatever we want to see. I asked what was computer doing in the dressing room?” he recollected. “If I wanted to see all the straight drives, if I wanted to see all the balls I had left outside the off-stump, it was available. Then I accepted it,” he added. 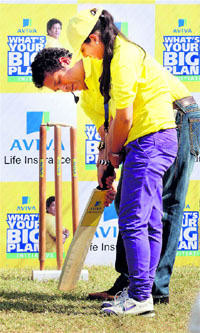 Tendulkar said adapting to new technology helped him prepare better. “Things have become different. It has helped us plan better against the opposition, whatever their weaknesses or strengths are, it has helped us. It is just about exposure and with time you learn to accept all these things. It has become a way of life for us,” he said. Talking to children on the sidelines of a venture, he said the satisfaction he got from playing cricket cannot be compared with anything else. “Just be true to yourself. Don't try and fool around. It is important that you take life seriously. Yes, you need to enjoy. I played cricket for so many years, I had lot of fun. I enjoyed doing what I wanted to do in life. It gave me the kind of satisfaction which cannot be compared with anything else “he said. Talking about his own kids, Tendulkar said his daughter Sara wants to be a doctor while his son Arjun is passionate about cricket. Tendulkar said people have become liberal in career choices and are encouraging kids to venture into unconventional territory. Addressing a press conference today, Sikander Singh Maluka, President, Punjab Kabaddi Association and Punjab cabinet minister disclosed that dope tests conducted on all the Indian players by the state government had been found negative. The National Anti Doping Agency (NADA) will also conduct tests randomly and those found positive, would be debarred from participation this tournament, said the president. "Cine celebrity, Priyanka Chopra will be the main attraction during the opening ceremony at Bathinda. Besides, other artists while another actor, Ranbir Singh will perform at Ludhiana during the closing ceremony,"added Singh. Maluka also released the list of players who would represent the country in this sports extravaganza. Sukhvir Singh Saravan and Sukhwinder Kaur will lead men and women's squads, respectively. Meanwhile, the apex kabaddi body, Amateur Kabaddi Federation of India (AKFI) has questioned organising World Cup by a state unit. In a letter to the president of AKFI, Ministry of Youth Affairs and Sports has made it clear that the permission has been granted to Government of Punjab for holding World Kabaddi Cup (circle style) which is not considered as an official World Cup. Keeping in view the idea of promoting sports events, the department had granted permission to state government during the last three years also for holding World Cup in circle style. The department has also sought clarification whether AKFI has sought permission from International Kabaddi Federation seeking no objection to Punjab government to conduct World Cup, the letter added. The men’s and women’s Kabaddi team of Pakistan will arrive in India via Attari-Wagah border tomorrow morning to participate in the Kabaddi World Cup which is all set to kick off in a grand opening ceremony in Bathinda. The team will cross over to India around 10 in the morning. It is likely to straight away head to Bathinda to prepare for their participation in the opening ceremony. Pakistan will play its first match with Scotland on Sunday. Bollywood stars Priyanka Chopra and Ranbir Kapoor are expected to perform on the opening and closing ceremony. To keep the momentum going Gippy Grewal and Miss Pooja will serve up the Punjabi pop for youngsters. While the sight of tattooed warriors with rippling muscles is a feast to the eyes, a riveting running commentary laced with ingenious couplets, poetry and rustic idioms make the tournament a huge draw in rural areas. Women: Sukhwinder Kaur ( captain) Mandeep Kaur, Suman Lata, Usha Rani, Priyanka Devi, Sukhwinder Kaur, Suman Gill, Ram Bateri (stoppers), Kulwinder Kaur and Meena (standby), Anu Rani, Khushbu, Reetu, Reena Rani, Randeep kaur, Sarabjit Kaur, Manpreet Kaur (raiders), Poly Devi (standby). For long this district was known to be a conveyer belt for producing top women gymnasts who, over the years, had earned the sobriquet the 'rubber dolls' of the town. That is the good part. Now comes the sad part. The Gurdaspur District Gymnastics Association (GDGA), the body that governs the sport in the district, has fallen on bad days. Its coffers are empty, following which the association cannot afford to send its gymnasts to take part in state level or national championships. An eerie silence prevails at the Parbodh Chander Memorial Hall, which has produced 13 international and nearly 100 national level gymnasts, as the anxiety of not being able to participate in the forthcoming national level championships haunts the trainees. A sub-junior meet was held at Kharar early this month and it was with much difficulty that coach Jagtar Singh - who is the spirit behind the iconic success of the centre and Romesh Mahajan, senior vice-president of the association, raised funds for the team's journey. The junior championship, which was recently held at Sangrur, saw just two boys from the centre taking part due to the paucity of funds. There are some important tournaments lined up in the near future, like the junior and senior nationals, but the lack of funds means that preparations of the gymnasts have been badly affected. This despite the fact that the Gurdaspur district provides a majority of the gymnasts to Punjab's squad in the Nationals. “The centre, often known as a factory which produces that magical elixir, the elasticity of youth, has surely fallen on bad times,” remarked Mahajan. “Without money the association is finding it difficult to sustain its day-to-day activities.” Four of the centre's trainees — Kanica Sharma, Sarabjit Kaur, Gulwinder Kaur and Naginder Kaur — had found a place in the national camp for the 2010 New Delhi Commonwealth games. Another top gymnast has been Samita Sharma who, as a 13-year-old 'wonderkid', donned the India colours in the SAARC Championship held in Allahabad in 1999. Other girls who have done the centre proud are internationals Jaswant Kaur, Parveen Sharma , Neeru Jabalia, Neeru Bawa, Rohika, Meenakshi, Sukhbir Kaur, Ramandeep Kaur and Amandeep Kaur. “We are perennially starved of funds. Whenever the media highlights our plight, politicians make tall claims of giving us money but seldom keep their promises," says Jagtar Singh. Connoisseurs of the sport are flummoxed by the way the sport, which at one time had brought international attention to the town, has fallen upon such bleak days. The 21-year-old javelin thrower from Dohki village was killed in a road accident and two of his friends were fatally injured when they were coming back after appearing in trials for the junior nationals in New Delhi. The athlete, currently residing in the SAI Training Centre hostel, had reportedly bagged the first position for Haryana in the trials for the same tournament but was rejected after another athlete, Praveen Kumar, performed better in subsequent tournaments. The protesting athletes allege that Abhishek was forced to appear for trials for the second time, this time from Delhi, due to the wrangling between the Chautala-led and the rival Olympic association. There were widespread protests as athletes from different disciplines gathered near the Hansi Gate and blocked traffic for hours. It was only after the police gave assurance that their plea would be heard by the Deputy Commissioner that they left the place. Hostel incharge Brij Bhushan said, "It's a very tragic incident. Abhishek was a promising athlete. He had lost his father two months back. Abhishek was desperate to make a place in the junior nationals, probably that is why he thought of trying his luck from Delhi." Former South African Olympian Clark was appointed the head coach of the junior side in April this year to prepare them for the World Cup, starting next month from December 6. Clark said they were working on their weakness — penalty corners — and the drag-flickers are being trained by penalty-corner specialist Sandeep Singh. Kolkata: Blaming N Srinivasan for the withdrawal of his company’s sponsorship of the Indian cricket team, Sahara chief Subrata Roy today said the BCCI president “does not keep on his commitments”. “We had a very good association with the BCCI in the past and had friendly relation with it. We used to work together,” he said. “But the present president (Srinivasan) has a different mindset and does not keep on his commitments... Has a lot of false ego. So we are not keen on continuing with the relationship.” Roy also attacked Srinivasan over IPL franchise Chennai Super Kings’ former team principal (and Srinivasan’s son in law) Gurunath Meiyappan’s alleged involvement in betting and fixing. “The case is on his team but nothing has happened. Had the principal of any other team been involved in something, that team would have been scrapped by now. But that is not happening. We don’t want to work in that environment,” said Roy. New Delhi: The International Hockey Federation (FIH) president Leandro Negre expects India to be a force to reckon with in the upcoming Hero Junior World Cup but said it won’t be easy for the hosts to win the tournament. Negre said the event is the perfect platform for talented young players to make a name for themselves. “Of course, if India were to win the tournament the impact would be huge, but with so many great hockey nations competing it is really difficult to predict who will lift the trophy,” Negre said of the tournament, to be held here from December 6. Chennai: Cricketer Dinesh Kathik has found his match in star squash player Dipika Pallikal as they got engaged in a private ceremony here. The 28-year-old wicketkeeper-batsman found his lady love, Pallikal, 22, after both ended up training under the same fitness coach here. After a one-year courtship, both decided to get engaged last week. Karthik and Pallikal have decided to tie the nuptial knot sometime in 2015 as both want to concentrate on their careers at the moment. After his divorce from his first wife Nikita, whom he married in 2007, Karthik had been focussing on returning to the Indian team. New Delhi: First-day joint leader Thidapa Suwannapura of Thailand shot a modest two-over 74 but still held on to her lead after the second and penultimate round of the Hero Women’s Indian Open 2013 being played at the Delhi Golf Club here. At four-under 140 aggregate, the Thai girl is one stroke clear of the other overnight joint leader Valentine Derrey of France, who managed a three-over 75, and Ladies European Tour sensation Charley Hull of England, who rose from fourth to tied second position after posting an even-par 72. Gauri Monga, the 20-year-old Indian amateur, underlined her class as she carded a two-under 70 in the second round to jump from overnight 13th to fourth.